Biryani with unique taste and flavor...Yes, it's Tandoori chicken biryani. 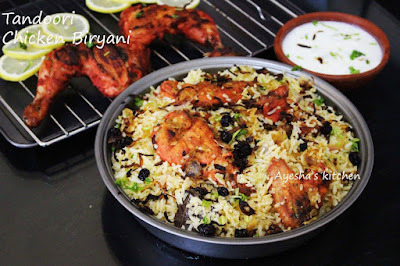 The best and perfect biryani for wonderful night parties or for a get-together parties. 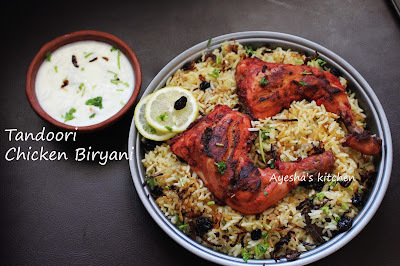 A delicious, aromatic, finger licking biryani recipe. It is simple when compared to other rice recipes but the time consumed for grilling the chicken is the only boring part. Here a well marinated and grilled chicken is steamed with biryani rice which makes this dish heavenly delicious. 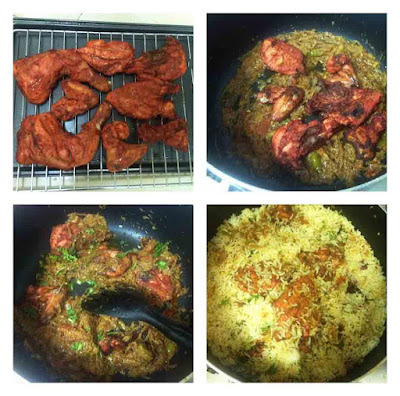 Tandoori chicken biryani is a very popular biryani in India and Pakistan. It is a popular offering at Pakistan and Indian restaurants all over the world. Tandoori chicken has its origin in India but, widely popular in South Asia, Malaysia, Singapore, Indonesia, Middle east and the western world. It is traditionally prepared in a clay oven called tandoor, and so this dish named as Tandoori chicken. Here we are using the tandoori chicken (which is marinated in yogurt and tandoori masala and then cooked at high temperatures in a tandoor) for the biryani recipe. As the unavailability of such tandoor at home, we can also use oven or grill or even on the stove top, with some minor changes. 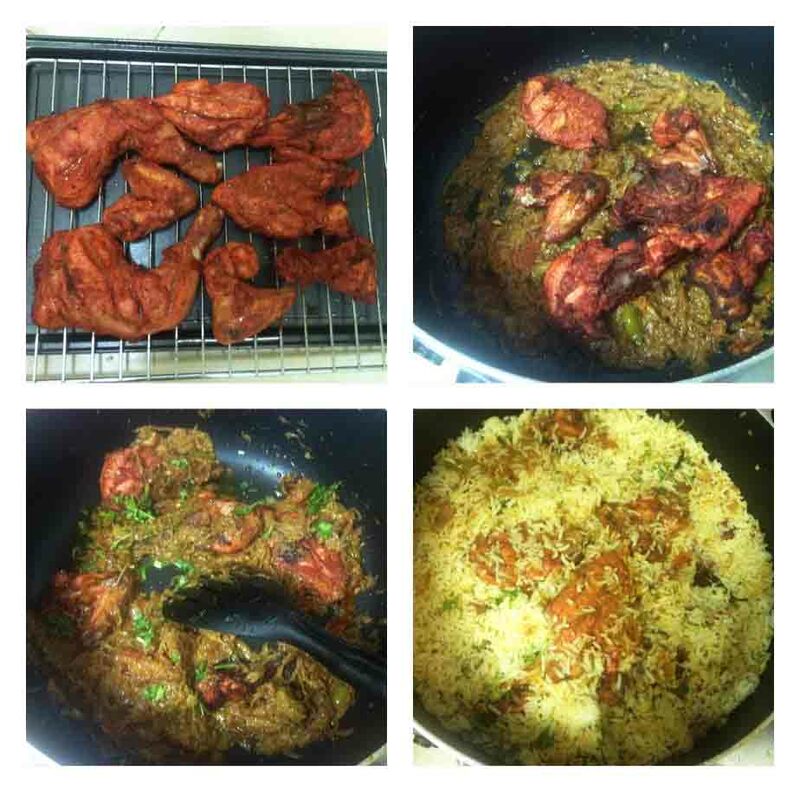 So try out this heavenly delicious Tandoori chicken biryani at home. 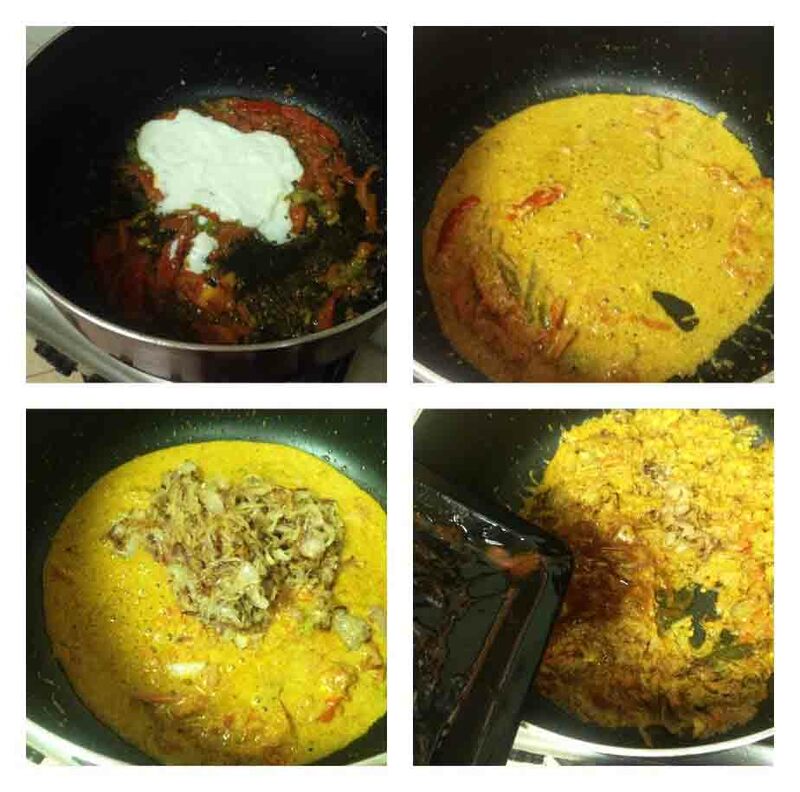 Do share your valuable feedback and hope you all will love this recipe. Enjoy cooking. Clean the chicken pieces well and pat dry. Make slits on each piece. 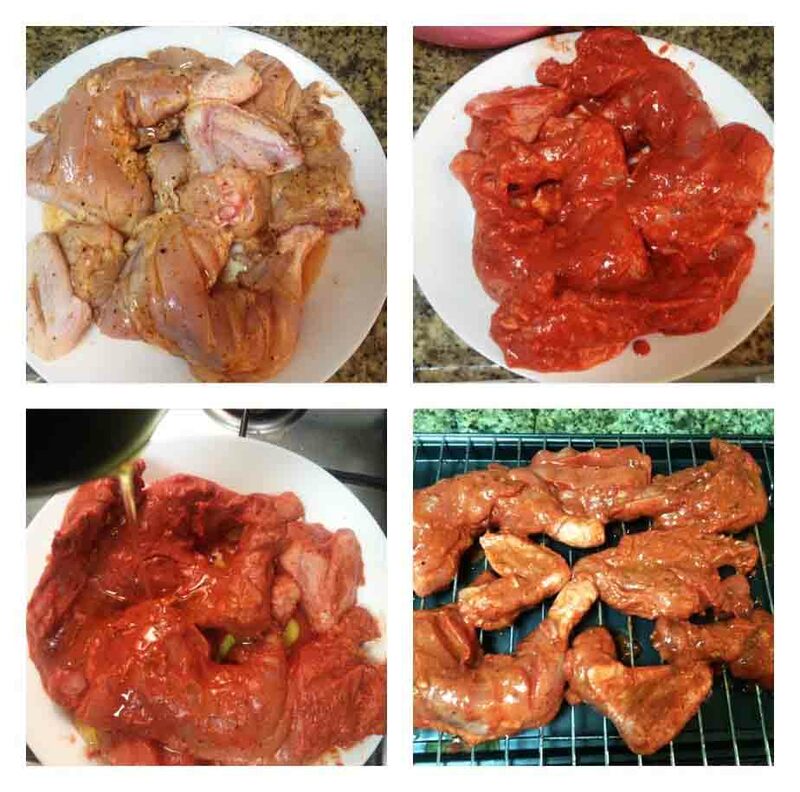 Apply salt, lemon juice and chilly powder all over the chicken and inside each slit. And keep in the freezer for 10 - 15 minutes or can set aside also. Meanwhile, make a thick smooth paste with all other ingredients (can blend in a grinder) except oil and marinate the chicken pieces with this marinade. Make sure to apply in between all slits. Finally, apply oil and mix well. Let it refrigerated for 2 hours or at least half an hour. Preheat oven to 200 degree C (it depends on the oven used). Place the chicken pieces on the grill (apply some oil on the grill) and keep a baking tray below the grill so that the gravy or the water from the chicken will be stored in that tray only. Cook for 20 minutes or until the chicken becomes tender and golden. Now flip the chicken and spread some oil on the top. Again cook for another 20 minutes or until it gets cooked well. Wash and soak rice for half an hour. Then drain it. Heat ghee in a vessel and add cardamom, cloves, cinnamon, bay leaves. 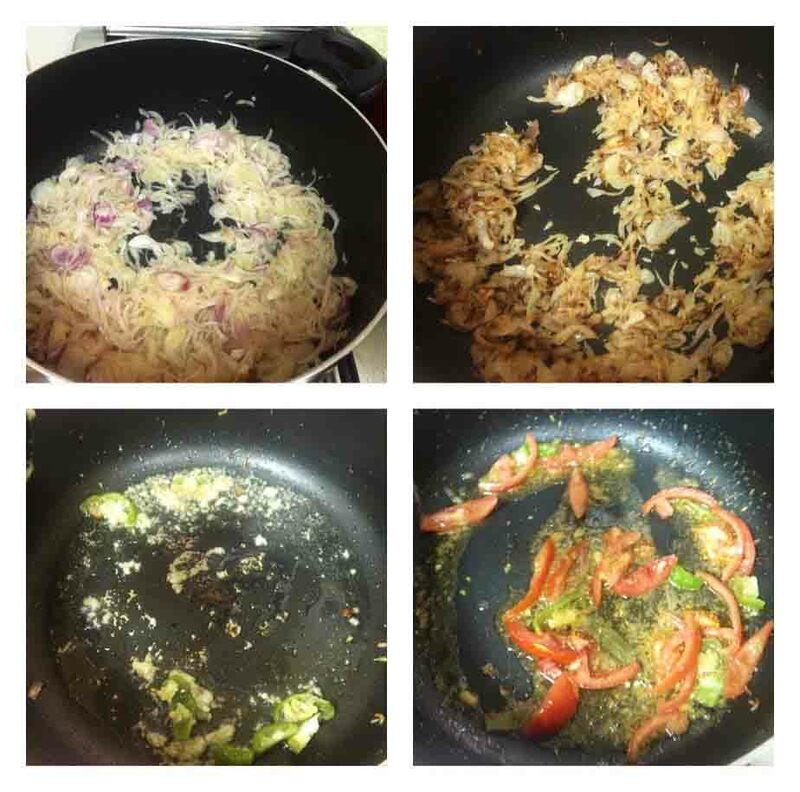 Saute for a while and add the drained rice. Saute for 5 minutes. 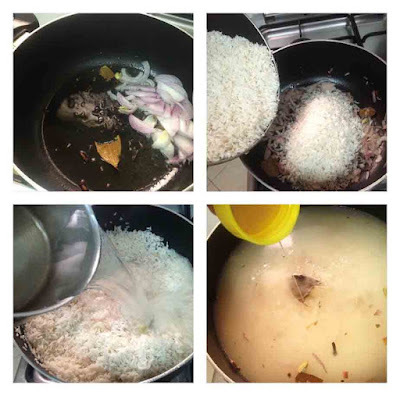 Now add 5 cups of boiled water(as rice is 3 cups) and mix well. Add salt and 1 tbsp of oil. Cook covered on a low flame until done (until the whole water gets dried). Remove from flame and let it stay aside uncovered. Do not mix when hot. Heat oil in a pan and saute the sliced onion until golden or transparent and transfer it to plate. Drain the excess oil if any. Now in the same oil saute ginger garlic paste and green chilies in a medium low flame, until the raw smell vanishes,. Then add sliced tomato and saute until mushy. To this, add turmeric powder, chili powder, garam masala powder and salt. Mix well. Now add yogurt and let it cook well in a medium flame. When done, add the sauteed onion and combine well. Now add the chicken stock collected while grilling the chicken (or can add chicken cubes). Mix very well and cook for few minutes. And now add the grilled tandoori chicken and mix well. Add chopped coriander leaves and give a fine stir. Now the gravy or masala is done. In a greased vessel, make a layer of prepared ghee rice, spread some ghee over it, then spread some brown onion, then some chopped coriander leaves and finally half of the chicken masala. Again layer some rice, then ghee, then brown onion and finally chicken masala. Garnish with fried nuts and raisins and some chopped coriander leaves. When done, serve hot with raita, pickle etc.